In the Philippines, 2 out of 5 high school graduates do not pursue tertiary education, hindered by the high tuition fees in addition to miscellaneous expenses incurred while studying. After spending many years working hard to make ends meet in order to put their children through school to obtain a high school diploma, it is often a disappointment to students who face the choice between working to help their family or sacrificing the education of other siblings so that one may be sent to college. In line with the mandate of our Constitution, the State must uphold the right of all citizens to quality education at all levels. 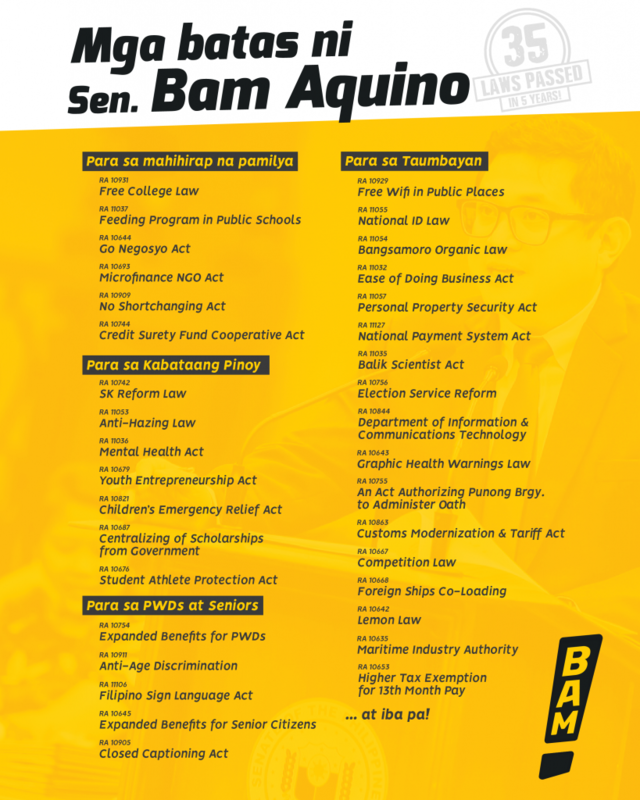 This bill seeks to make tertiary education in all State Universities and Colleges free of tuition for its students and fully subsidized by government. Tertiary education is a valuable key that can help Filipino families break out of the poverty cycle, as families headed by tertiary degree holders earn, on average, two times as much as families who do not have postsecondary education. However, higher education is often only available to middle-income families who can afford the high tuition fees and extra costs. As a result, these families continue to reap the benefits of obtaining a postsecondary education while poor families continue struggling to reach beyond their current economic situation. In a nation with glaring income and educational inequality, the provision of tuition-free college education will be one great leap toward developing our fragile democracy. By unlocking this opportunity, poor and low-income families stand to benefit the most and will be empowered both economically and socially to be able to fully participate in our democratic nation. A college education is not only a qualification that results in higher paying jobs, but is most importantly a means for the development of knowledge, innovation and social change in a nation. Supporting the growth of higher education in the Philippines will serve to heighten the quality of workforce so that we may partake more meaningfully in the global production of knowledge. AN ACT CREATING THE DEPARTMENT OF INFORMATION AND COMMUNICATIONS TECHNOLOGY, DEFINING ITS POWERS AND FUNCTIONS, APPROPRIATING FUNDS THEREFOR, AND FOR OTHER PURPOSE. 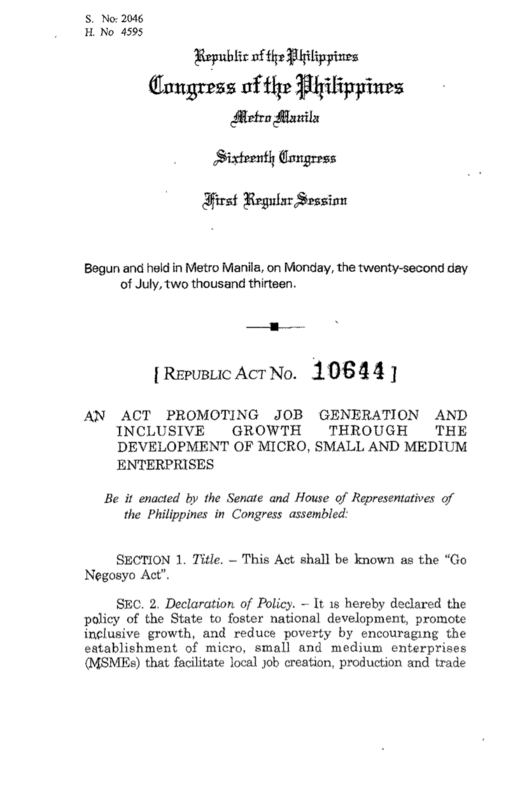 The Go Negosyo Act gives Filipinos – from a simple housewife to ordinary employee – a chance to establish their own business that will help sustain their everyday needs and for their families. The Act mandates the creation of Pinoy Negosyo Centers, under the Department of Trade and Industry (DTI), in each city and municipality around the country. These Pinoy Negosyo centers are meant to make it easier for entrepreneurs to register and start up their businesses, as well as gain access to sources of financing. In addition, the Pinoy Negosyo Centers will provide courses and development programs, training, give advice on business conceptualization and feasibility, financing, management, capability building, human resources, marketing and other support services. An act requiring all franchise holders or operators of television stations and producers of television programs to broadcast or present their programs with closed captions option, and for other purposes. The passage of the Fair Competition Act into law will eliminate monopolies, cartels and other unfair business practices that lead to high prices of goods and services. Senator Bam Aquino, chairman of the Senate Committee on Trade, Commerce and Entrepreneurship, made this pronouncement during his sponsorship speech for Senate Bill No. 2282 or the Fair Competition Act of 2014. “If this bill will be enacted into law, rice cartels that caused the sudden rice of prices will cease to exist,” the senator said, adding that President Aquino himself called for the elimination of this illegal practice to drive down prices of goods and other products. Aquino said the bill safeguards the welfare of businesses, large and small, and protects honest, hard-working entrepreneurs against abuse of dominance and position, and other unfair practices that put both Filipino businesses and their consumers at risk. “The Fair Competition Act, moreover, promotes a culture of healthy competition that inspires ingenuity, creativity, and innovation in addressing market needs,” added Aquino, whose Senate Bill No. 1027 or the Philippine Fair Competition Act of 2013 was among the measures consolidated under Senate Bill No. 2282. In his speech, Aquino said the Fair Competition Act of 2014 will, among other things, promote and enhance economic efficiency and competition and ensure that industrial concentration would not limit economic power to a few. “It will also prohibit anti-competitive agreements and abuses of dominant position that distort, manipulate, or constrict the operations of markets in the Philippines,” the senator stressed. Aquino added that the push for inclusive growth would be much easier with a help of a competition policy that gives entrepreneurs and small businesses the capability to compete against big businesses. “I’m hoping this competition policy, if passed, can support our micro, small and medium enterprises, let them grow into larger enterprises and provide more jobs to our countrymen,” Aquino emphasized. At the same time, Aquino allayed fears that big businesses with high market share will be affected by the competition policy. “This is not against companies that have high market share. It’s against companies with high market share and who are using that position to abuse their powers or abuse smaller players in the market,” he explained. The Philippines is one of few developing countries that do not have a valid competition policy. In the past two decades, Congress tackled several competition bills but lawmakers failed to find common ground on key provisions, hampering their passage into law. The SK Reform Act seeks to uphold youth representation by returning to the true spirit of volunteerism and taking youth participation away from the clutches of partisan politics. It is anchored on the twin beliefs that youth organizations are a potent force in nation-building, and that the power of young Filipinos is strongest when they work with people who share their values and goals, and in an environment of teamwork and collaboration. About 250,000 public school teachers sit as chairmen or member of the board election inspectors when Filipinos elect their president, vice president, senators, and members of Congress, governors, mayors and councilors. Taking part in upholding the right of the Filipino to suffrage is not that Simple for these teachers. After tirelessly working for the preparation, conduct and counting of votes of the elections, teachers receive insufficient compensation for their service. This is further aggravated by the delay in the release of their honoraria, even taking months. Teachers are also exposed to high security risks as they perform their election duties, having alarming instances of harassment, violence and death, especially in election hotspot areas. According to a national paper, there were five casualties among the teachers in the 2010 elections. Moreover, about a hundred teachers end up getting charged before Comelec by losing candidates. These candidates contest the results as they complain about the teachers’ conduct of the elections. In addition, their mandatory duties have prevented the teachers from voting because most of them are assigned in precincts that they are not registered as voters. It is essential that assistance be provided to the teachers who have selflessly performed this important task every election year, even as they have developed a moral responsibility for doing it. The BEl reform bill has had earlier versions in the past Congresses. HB 4096 promoted the voluntary election services and HB 6528 promoted an insurance package for BEl members. This bill aims to integrate the provisions of the two earlier versions into a comprehensive package of reform policy. The bill attends to the key problems of the BEl members; they are to receive a minimum honoraria, insurance, equitable legal package commensurate of their service, and voting privileges. The proposed amendment also gives the teachers the liberty to choose whether or not to serve in the elections. This allows them to protect themselves from political pressures and consider their personal welfare. As teacher training and election operations are straining for the Department of Education’s resources, the rich reservoir of civic volunteers can be tapped as alternative source of manpower for BEl members and poll staff. Due to their experience in election monitoring the past elections, they have the competence and integrity operating the polls. The government then allows its citizens to further participate in the ensuring the legitimacy of the election process. The proposed amendment builds on the recognition of its teachers as they play an important role in the conduct of the democratic processes of the Filipinos and extends the space where citizens can actively participate in the reform of institutions.